You want your children to learn good oral hygiene habits. In order to entice children to brush, many training and children's toothpastes are made to taste like things that children like - bubblegum, strawberry, cherry, orange - and sweetened with sugar substitutes, such as Sorbitol. Unfortunately, since these toothpastes taste delicious, children tend to want to eat them. While it won't often cause much more than a minor tummy-ache (although ingesting too much fluoridated toothpaste can lead to white or slightly discolored spots on adult teeth), you don't want your children to eat their toothpaste. There are some things you can do to help them stop. Put only a small amount of toothpaste on your child's toothbrush. Make sure you do it for him so he can see how much he needs. Children have a tendency to squeeze too much. It should be just enough to clean his teeth. After the toothpaste is applied to the brush, put the bottle up on a high shelf in the cabinet, out of your child's reach. Or, keep it in a locked medicine cabinet. If your child can't reach it, he can't eat it. Mint is not an enticing flavor to eat. This should be carefully considered though. 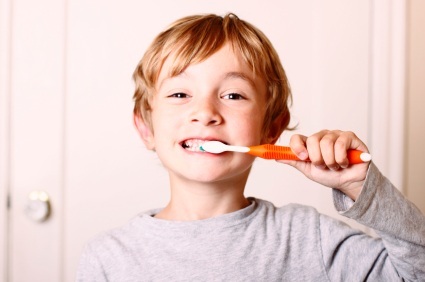 Younger children may be turned off from brushing completely if given a strong minty flavor. Watch your child as he brushes his teeth. Make sure he spits out the toothpaste instead of swallowing it. Also make sure he rinses his mouth with fresh water. Children tend to mimic their parents. Turn this daily routine into a fun time for the both of you and brush your teeth together. Lead by example. Let him see how you brush your teeth and encourage him to copy your behavior. You want your children to develop healthy oral hygiene habits. With the enticing flavors of children's toothpaste, they might be tempted to consume what is meant to clean their teeth. Work with them to help them stop and keep their mouths healthy. Please contact us if you have any questions about keeping your kids from eating toothpaste.